Nice (and glad he is OK)! Our pediatrician tipped us off to this place after a visit to the regular CareNow had us terrified that C had measles when it was just roseola. They almost drew a huge amount of unnecessary blood from my tiny girl! Her doc said there is such a huge difference between pediatrician and general medical training that we should always opt for this one if we can. Glad to know you had a good experience! 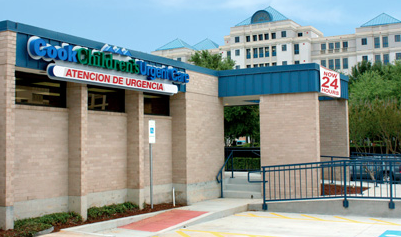 I am so happy to hear of your great experience for your child in the middle of the night at Cook Children's Urgent Care. My husband works there and tries to make sure that it is efficient and that each family is treated well to their satisfaction. I worked as a nurse at Cook's many years ago before starting our family, and there is nothing like it! I am so glad we have a fabulous hospital in Fort Worth for our kids too!! Blessings! Thank you so much for your comment! So many times our community helpers are recognized for their efforts (and rightly so! ), but our medical community helpers are not as recognized despite the fact that they go in to work no matter the weather or the holiday too. Big thanks to your family!!! I was thoroughly impressed with the whole outfit! Just FYI they don't take blue Cross blue shield. You have to go to the one in grapevine (I think that's where it was. With the case of croup we had I'm lucky I can remember anythin). It was great as well. But a bit ofa drive compared to downtown.